Individual citrus-scented, non-alcoholic, antibacterial wipes Unfolded wipe measures 8 1/4"w x 4 3/4"h Imprint :	This item is not available for imprinting. Product Size: 3-1/8"w x 2-3/4"h Packaging: Bulk. Sanitary sealed individual packet containing one of our Citrus Scented Antibacterial Wipes is available with our stock artwork or with a custom imprint. Very portable, as well as a great asset to use on hands or on surfaces that need to be disinfected. Product Size: 3-1/8"w x 2-3/4"h Imprint Size: 2"w x 1-1/4"h Note: Cannot guarantee exact color match. Packaging: Bulk. Empty frosted bottle features choice of 7 cap colors and pocket clip. Attachment Options: Split key ring with nylon strap and carabiner or clip-on lanyard. Both options are $0.50 attached. Product Size: 5/8"w x 5"h Imprint Size: 2-3/8"w x 1"h Note: Cannot guarantee exact color match. Packaging: Bulk. 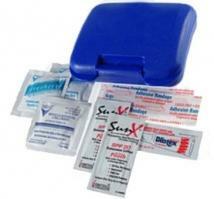 Handy Flip top mini kit includes two latex-free bandages and two sunscreen packets. Two-tone Kits have white base and colored flip top. Product Size: 4-3/8" x 2-1/16" x 1/2" deep Front Bottom Imprint Area: 1-1/2"Wx 1 5/8"H Flip-top Imprint Area: 1"Hx 1-1/8"W Back Imprint Area: 1-1/2"Wx 3-1/2"H Packaging: Individual Polybag Packaging Dimensions: 16"(L) X 12"(W) X 14"(H)12 Units Per Box: 250 Shipping Weight: 18 lbs. Pack in the fun for the little ones with this unique pocket pack. It holds 2 tattoo bandages (a happy-face and a tie-dye version), a sheet each of stickers and temporary tattoos. It's a great way to spread fun & an advertising message at the same time. 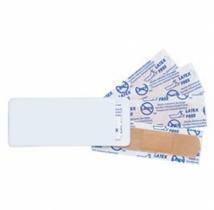 Great first aid kit for direct mail and distribution programs|Designed especially for children|Product is CPSIA compliant|Latex-free bandages Includes: 2 character bandages, 1 sheet of stickers, 1 sheet of temporary tattoos. 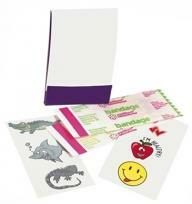 Great for direct mail and distribution programs, Specially designed for children. Size : 1-3/4"w x 2-7/8"h x 1/4"d. Imprint Locaton: Outside Front Cover (Standard): 1-1/2"w x 2"h, 4 color(s) max |Outside Back Cover (Optional): 1-1/2"w x 2"h, 4 color(s) max |Outside Front Cover and Outside Back Cover (Optional): 1-1/2"w x 2"h each location, 4 color(s) max. Packaging: Bulk Pack Of: 1050 Weight: 12 lbs. 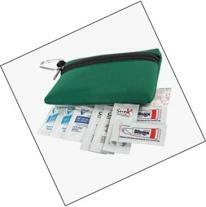 With its slim design, this outdoor kit fits easily into pocket or purse. Holds 3 vinyl bandages and 2 SPF 30 sunblock packets. Options: Substitution of customer supplied bandages available at no additional charge. Maximum wrapper size of customer supplied bandages: 3 3/4" H x 1 5/16" W. Dimensions: 2" H x 4 1/2" W x 3/8" D Imprint Area: Front: 1" H x 1 3/4" W Flap: 1" H x 1 1/4" W Back: 1 1/8" H x 3" W. Packaging: Individually poly-bagged Shipping Info: Box Dimensions: 18" L x 16" W x 12" H Shipping Weight: 6.54" lbs / 100 pcs 450 pcs / box. 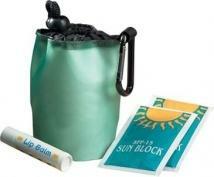 Waterproof tote contains two sunscreen and two Blistex packets. Custom Kits Available - Call for Pricing. Eco Navy Blue, Eco Dark Green, Eco-Tan and Black molded with up to 100% home recycled material. Product Size: 4 1/4" x 1" diameter Imprint Area: 2"W x 2"H (Wrap Imprint: 2"H x 4"W) Packaging Dimensions: 16"(L) X 16"(W) X 5"(H) Units Per Box: 100 Shipping Weight: 12 lbs. 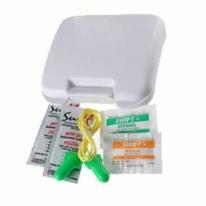 Handy Flip top mini kit includes two latex-free bandages and two sunscreen packets. Two-tone Kits have white base and colored flip top. Product Size: 4-3/8" x 2-1/16" x 1/2" deep Imprint Area: 1-1/2"x 2" Flip-top Imprint Area: 1"x 1-1/2" Back Imprint Area: 1-1/2"x 3-1/2" Packaging: Individual Polybag Packaging Dimensions: 16"(L) X 12"(W) X 14"(H) Units Per Box: 250 Shipping Weight: 18 lbs. Brightly colored polyester zip bag with hang clip is convenient, compact and excellent for trade show give-aways. Contains one Sunscreen packet, one Blistex, two latex-free adhesive bandages, one antiseptic towelette, two moist towelettes. Case Size: 3 1/4" x 4 3/4" Imprint Area: 1 1/2"H x 3 1/2"W Packaging Dimensions: 20"(L) X 15"(W) X 10"(H) Units Per Box: 250 Shipping Weight: 20 lbs. This new slim line rectangular water-proof tote is just the right size for credit cards, hotel room cards and cash. Contents: two sunscreen packets and one Blistex packet. Product Size: 2 1/2" x 3 3/4" x 1/2" Base Imprint Area: 2 1/8"W x 1 5/8" to 2 3/8"H Packaging: Individual Polybag Packaging Dimensions: 16"(L) X 16"(W) X 5"(H) Units Per Box: 100 Shipping Weight: 12 lbs. Brightly colored translucent zip bag with hang clip is convenient, compact and excellent for trade show give-aways. Contains two Sunscreen packets, one Blistex, two latex-free adhesive bandages, one antiseptic towelette, two moist towelettes. Case Size: 3 1/4" x 4 3/4" Imprint Area: 1 1/2" x 3 1/2" Packaging Dimensions: 20"(L) X 15"(W) X 10"(H) Units Per Box: 250 Shipping Weight: 17 lbs. Vinyl pocket pouch is refillable; and can be used to hold business cards! Contact Our Factory For CustomKits! Our Specialty! 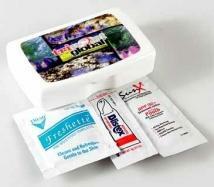 Size: 2 -1/2" h x 4" w Standard Imprint Area: 2" h x 3 -1/4" w. Packaging: Bulk. Shipping Weight: 500 / 25 lbs. Contains two sunscreen packets, one Blistex packets, two latex-free adhesive bandages, two wash-up towelettes, antiseptic towelette. Eco Navy Blue, Eco Dark Green, Eco-Tan and Black molded with up to 100% home recycled material. Product Size: 3 1/8" x 4 1/4" x 7/8" Imprint Area: 1 7/8"H x 3 1/2"W Packaging Dimensions: 22"(L) X 16"(W) X 10"(H) Units Per Box: 250 Shipping Weight: 30 lbs. 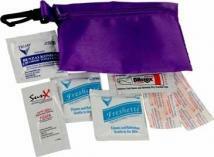 Clip 'n Go Bag 2 SPF30 Sunscreen Packets 2 Adhesive Bandages 1 Antiseptic Towelette 1 Lip Ointment Packet 1 Moist Towelette. Size: 5" W x 3-3/8" H Imprint Area: 3-1/2" W x 1-1/2" H Packaging: Bulk packed. Weight: Available upon request. 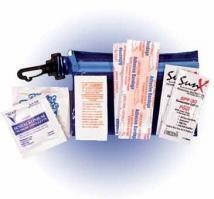 Contains ear plugs, Sunscreen, non-aspirin pain reliever packet, antacid packet. Product Size: 4 1/4" x 3 3/4" x 1 1/2" Imprint Area: 1 1/2" H 2 3/4" W Packaging Dimensions: 22"(L) X 16"(W) X 10"(H) Units Per Box: 125 Shipping Weight: 22 lbs. Contains two Sunscreen packets, two Blistex packets, two latex-free adhesive bandages, two wash-up towelettes, antiseptic towelette. Product Size: 4 1/4" x 3 3/4" x 1 1/2" Imprint Area: 1 1/2" H x 2 3/4" W Packaging Dimensions: 22"(L) X 16"(W) X 10"(H) Units Per Box: 125 Shipping Weight: 22 lbs. Go-anywhere pouch assures a terrific tan! Available in Slim Vinyl Pouch. 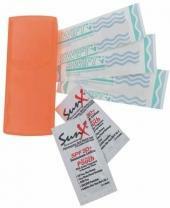 SPF-15 Sunscreen packets Wrapper colors White, Gold, or Silver. Size: 4 3/4" x 3 1/4" Max Imprint Area: 3 1/2" x 2 1/2" WT_100: 8 LBS. Paper-Proof: $10. (Required on all labels). Contains two SPF 30 sun block, two Blistex packets, two latex-free adhesive bandages, three moist towlettes. Product Size: 4 1/4" x 2 3/4" x 1 1/4" Imprint Area: Top 3/4"H x 2"W; Bottom 2"W x 1-7/8"H Packaging: Individual Polybag Packaging Dimensions: 20"(L) X 16"(W) X 10"(H) Units Per Box: 100 Shipping Weight: 20 lbs. Sun kit. 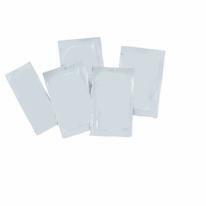 3 Stock Sunscreen Packets Lip Balm Bulk Packed. Size: 5 1/4" W x 5 1/2" H Max Imprint Area: 3 1/4" W x 3 1/4" H WT_100: 11 LBS. Paper-Proof: $10. (Required on all labels). 20:10. Note: Othere charges apply for other imprint. This practical kit covers all the bases, from sun protection items to bandages. This would be an outstanding handout at conventions and tradeshows! Outstanding handout for conventions and trade shows. Sun protection products are PABA free and water resistant. Latex-free bandages. 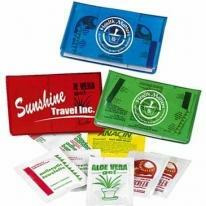 Includes: 8 pieces: Aloe vera gel packet, Anacin(R) packet, 2 antiseptic towelettes, 2 bandages, 2 SPF-30 sunblock packets. 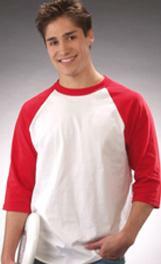 Size: 3-15/16"w x 2-1/2"h x 1/2"d. Imprint Location: Front (Standard): 3"w x 2"h, 4 color(s) max. Back (Optional): 3"w x 2"h, 4 color(s) max Packaging: Bulk Pack Of: 105 Weight: 8 lbs. Brightly colored neoprene zip bag with 50mm carabiner contains three sunscreen packets, two Blistex packets, two latex-free adhesive bandages, one antiseptic towelette, two wash-up towelettes. Case Size: 3-3/4" x 5 1/2" Imprint Area: 1 1/2"H x 3 1/2"W Packaging Dimensions: 20"(L) X 16"(W) X 10"(H) Units Per Box: 250 Shipping Weight: 27 lbs. 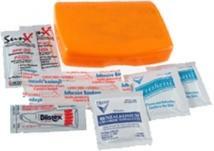 Clip 'n Go Bag 2 SPF 30 sunscreen packets 2 adhesive bandages 1 antiseptic towellette 1 lip ointment packet 1 moist towelette. Pricing Includes: Full color printing on kit only using four-color process colors (cyan, magenta, yellow and black) on one side with contents (unimprinted) inserted inside the packet. Imprint Area: 3-1/2" W x 1-1/4" H. Packaging: Bulk packed. Weight: Available upon request. Less Than Minimum: Not available. 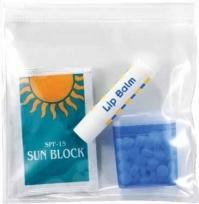 Sun Kit with Lip Balm, Sunscreen Packet and Mint Dispenser. Water-Resistant. Sweat-Resistant Dry, Non-Oily Free Feel. Recommended For Dry/Normal & Mature Skin Types. 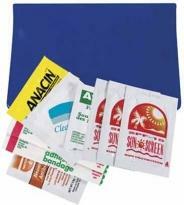 Imprinting Information: Bag Imprint: (One color imprint only) Set-up charge $45. Re-order set-up charge $20. For customizing contents, minimum quantity 250 pieces. Packets: Set-up charge $75 per color, up to 3 colors. Re-order set-up charge $20 per color. No less than minimum. Full bleed available. Lip Balm: Set-up charge is $45 for printing labels 1 to 4 color process. Re-order setup charge $20. Exact PMS color match not available for 4-color process. Reference your requested PMS colors and we will match as close as possible. Each flavor change there will be an additional set-up charge. Minimum of 250 pcs per flavor. Re-order setup charge $20. Mint Dispenser: Spot Color Imprint: Set-up charge $45 per color/location. 2nd color/location running charge $.20. Re-order setup charge $20 per color/location, 2nd color/location running charge $.20. 4 Color Imprint: (Clear item only) Set-up charge $95 and add $.45 running charge. Re-order set-up charge $45 and add $.45 running charge. No less than min. Absolute Minimum Order Quantity: 100. 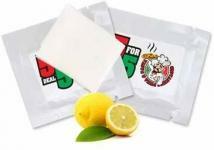 Item Size: 5 1/4" W x 5 1/2" H Max Imprint Area: 3 1/4"W x 3 1/4"H Wt_100: 11 lbs Packaging: Bulk Packed. This vinyl case holds an assortment of products to help make outdoor life more comfortable. Sun-protection products are PABA free. Product Includes: 9 pieces: Anacin packet, antibiotic ointment packet, 2 bandages, clean nap, insect sting wipes, 3 SPF-15 sunblock packets. Imprint Area: Back (Standard): 4"w x 2-1/4"h, 4 color(s) max. Front (Optional, additional charge): 4"w x 2-1/4"h, 4 color(s) max. 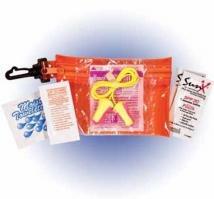 Product Size : 4-3/4"w x 3-7/16"h x 1/2"d. Packaging: Bulk Pack Of: 150 Weight: 10 lbs. Fun in the Sun kit in cool translucent vinyl tote bag. Drawstring and clip-on carabiner make sure your logo stays around! Lip Balm. 4 SPF-15 Sunscreen Packets. Bulk packaging. Water-Resistant Sweat-ResistantDry, Non-Oily Free Feel Recommended For Dry/Normal & Mature Skin Types. Size: 2 3/4" W x 4 1/2" H Max Imprint Area: 2" W x 1 1/2" H WT_100: 17 LBS. Paper-Proof: $10. (Required on all labels). 20:10 Note: Othere charges apply for other imprint. 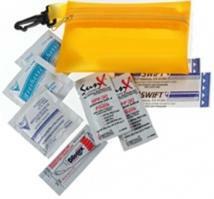 Clip 'n Go Bag 1 corded ear plug (individually wrapped) 2 SPF 30 sunscreen packets 1 moist towelette 1 lip ointment packet. Pricing Includes: Full color printing on kit only using four-color process colors (cyan, magenta, yellow and black) on one side with contents (unimprinted) inserted inside the packet. Imprint Area: 3-1/2" W x 1-1/4". Packaging: Bulk packed. Weight: Available upon request. Less Than Minimum: Not available. 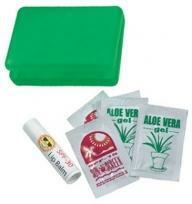 Sun & aloe kit in 3500 (StandarRectangular Case). Size : 2 7/8" h x 5" w x 7/8" d. Standard Imprint Area : 1 7/8" h x 2 3/4" w Includes : All the kits contain (3) SPF15 sunblock packets, (2) aloe vera gel packets, (1) SPF30 standard lip balm/sun block stick (plain flavor). Packaging : Bulk. Shipping Weight : Varies. 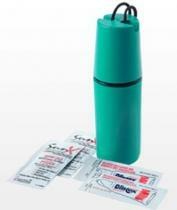 Sun & aloe kit in model a (Waterproof Cylindrical Shape Sportsafe ). Size : 4 1/2" h x 1 1/4" d. Standard Imprint Area : 2" h x 2" w. Includes : All the kits contain (3) SPF15 sunblock packets, (2) aloe vera gel packets, (1) SPF30 standard lip balm/sun block stick (plain flavor). Packaging : Bulk. Shipping Weight : Varies. 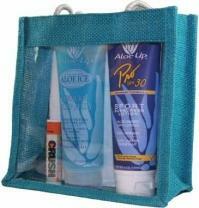 Sun &aloe kit in 8002 (Large Rectangular Sportsafe). Size : 4 1/2" h x 2" w x 1 1/4" d. Standard Imprint Area : 1 1/2" h x 1 5/8" w. Includes : All the kits contain (3) SPF15 sunblock packets, (2) aloe vera gel packets, (1) SPF30 standard lip balm/sun block stick (plain flavor). Packaging : Bulk. Shipping Weight : Varies. SPF 30 2 oz Sunscreen w/Custom Imprint, 0.5 oz Hand Sanitizer w/Custom Imprint, SPF 15 Moisture Lip balm w/Custom Imprint. Throw a kit in your carry on and be on your way. All the essentials in one convenient bag. Great for golf events! Imprint Type: 4 Color Process Label. 1 Color included (up to 4 spot colors). Imprint Area: Sunscreen: 1.0" x 1.5", Sanitizer: 0.88" x 1.15", Lip Balm: 1.75" x 0.95" Packaging Information Box Dimension: 14" x 10" x 11" Packaging: 50 per box Weight: 20 lbs. SPF 30 2 oz Sunscreen w/Custom Imprint, Peppermint Breath Mints w/Custom Imprint, SPF 15 Moisture Lip balm w/Custom Imprint. Throw a kit in your carry on and be on your way. All the essentials in one convenient bag. Imprint Type: 4 Color Process Label. 1 color included (up to 4 spot colors). Imprint Area: Sunscreen: 1.0" x 1.5", Mints: 0.96" x 1.35", Lip Balm: 1.75" x 0.95". Packaging Information Box Dimension: 14" x 10" x 11" Packaging: 50 per box Weight: 25 lbs. Your name or message are bound to shine on these unique waterproof sun kit with carry strap. Stock lip balm. 3 SPF-15 stock sunscreen packets. 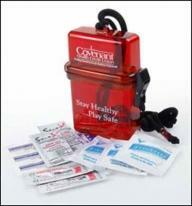 Translucent waterproof container, featuring secure snap-down closure and adjustable carry strap. Wrappers available in White, Gold, and Silver. Label colors available in White, Gold, and Silver. Individually poly bagged. Water-Resistant Sweat-ResistantDry, Non-Oily Free Feel Recommended For Dry/Normal & Mature Skin Types. Size: 3 3/4" W x4 1/2" H x 1 1/4" D Max Imprint Area: 1 3/4" W x 2" H. WT_100: 21 LBS. Paper-Proof: $10. (Required on all labels). 20:10 Note: Othere charges apply for other imprint. 28 oz. Transparent Bike Bottle Sun Kit includes sunglasses and sunscreen bottle inside. Assembled with Push Pull Cap. Hand Wash Only. Ships Assembled at No Extra Charge. Product Size: 2-7/8" diameter x 9-3/4" tall Imprint Area: Top: 3/4" x 3 1/2" or 3/4" x 8" Wrap; Base: 3 1/2" x 3 1/2" or 3 1/2" x 8" Wrap Standard Packing: Individual poly-bag Packaging Dimensions: 30"(L) X 15"(W) X 11"(H) Units Per Box: 50 Shipping Weight: 11 lbs. Sunscreen and lip balm holder. SPF15 Call for quote for SPF30. Lip balm with stock label. 2oz Carabiner bottle. Individually poly bagged. Water-Resistant Sweat-ResistantDry, Non-Oily Free Feel Recommended For Dry/Normal & Mature Skin Types. Size: 2 7/8" W x 5" H x 1 1/8" D Max Imprint Area: 1 1/2" W x 1 1/4" H WT_100: 25 LBS. Paper-Proof: $10. (Required on all labels). 20:10 Note: Othere charges apply for other imprint. 22 oz. 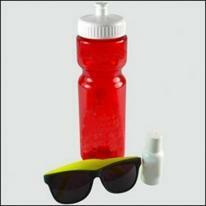 / 600ml Transparent Sports Bottle (TRB22T) - with Sunscreen (SN301), Lip Balm (LB15) and Bandage Dispenser (BD5). Molded with Dishwasher-safe, BPA-free Tritan. Ships Assembled at No Extra Charge. Product Size: 2-3/4" diameter x 7" tall TRB22T Bottle Imprint Area: 2-1/4"W x 5"H / side Imprint Method: Silkscreen SN301 Imprint Area: 1-1/2"W x 1-1/2"H LB15 Imprint Area: 1-3/4" x 5/8" Imprint Method: 1c Label BD5 Imprint Area: 2-3/4" x 1-1/8 Standard Packing: Individual poly-bag Packaging Dimensions: 30"(L) X 15"(W) X 9"(H) Units Per Box: 50 Shipping Weight: 21 lbs. SPF 30 2 oz Sunscreen w/Custom Imprint, 2.0 oz Aloe Vera Gel w/Custom Imprint, SPF 15 Moisture Lip balm w/Custom Imprint. Throw a kit in your carry on and be on your way. All the essentials in one convenient bag. Great for golf events! Imprint Type: 4 Color Process Label. 1 color included (up to 4 spot colors) Imprint Area: Sunscreen: 1.5" x 2.15", Aloe Vera: 1.0" x 1.3", Lip Balm: 1.75" x 0.95". Packaging Information Box Dimension: 14" x 10" x 11" Packaging: 50 per box Weight: 20 lbs. 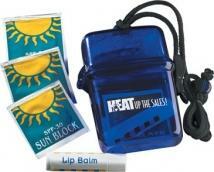 Includes Pro Lip Balm & 1 oz SPF 30 Sunscreen all in a Small Mesh Bag. Size : 5 x 7. Image area 2.5? W x 1? H Mesh bag colors are: Black, Blue, Red, White and Lime Green. SPF 30 4.0 oz Sunscreen w/Custom Imprint, 4.8 oz Aloe Vera Gel w/Custom Imprint, SPF 15 Moisture Lip balm w/Custom Imprint (x2). Throw a kit in your carry on and be on your way. All the essentials in one convenient bag. Imprint Type: 4 Color Process Label. 1 color included (up to 4 spot colors) Imprint Area: Sunscreen: 1.5" x 2.15", Aloe Vera: 1.5" x 1.8", Lip Balm: 1.75" x 0.95". Packaging Information Box Dimension: 14" x 10" x 11" Packaging: 50 per box Weight: 20 lbs. 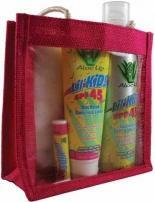 Includes Natural Lip Balm, 1 oz SPF 25 Sunscreen & 1 oz Aloe Ice Jelly all in a Small White Mesh Bag. Size : 5 x 7. 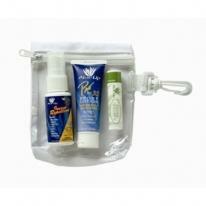 Includes: 1oz Pro SPF 15, 1oz Pro SPF 30, Pro SPF 15 Lip balm on a carabiner. Spa/exercise towel. 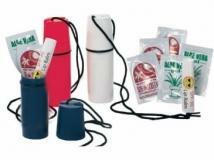 Includes Natural Lip Balm, 1 oz SPF 30 Sunscreen & 1 oz Insect Repellent all in a Small White Nylon Bag. Size : 4.75 x 5.75. 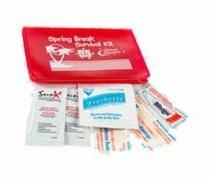 Includes Medicated Lip Balm, 1 oz SPF 25 Sunscreen, 1 oz Light Moisturizer & Aloe Vera Gel Foil Pack all in a Small White Nylon Bag. Size : 4.75 x 5.75. 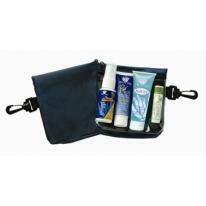 Includes Natural Lip Balm, 1 oz SPF 30 Sunscreen & 1 oz Aloe Ice Jelly all in a Small Nylon Bag. Size : 5 x 5.5. 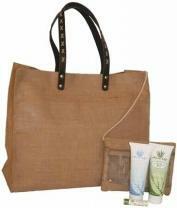 Includes Natural Lip Balm, 4 oz SPF 25 Sunscreen, 4 oz Light Moisturizer & 1 oz Aloe Ice Jelly all in a Medium White Mesh Bag. Size : 6 x 8. Includes Pro Lip Balm, 1 oz SPF 15 Pro, 1 oz SPF 30 Pro, 1 oz Aloe Ice Jelly, Aloe Kote SPF 25 & Aloe Kote Plus all in a Large Nylon Bag. Size : 7.5 x 5.5. Includes: 4oz Pro SPF 30, 4oz Aloe Ice Jelly, SPF 15 Lip Balm. Spa/exercise towel. Includes: 4oz Core 15, 4oz Core 30, SPF 15 Lip Balm, spa/exercise towel. Includes: 4oz SPF 45 Lil Kids, 6oz SPF 45 Lil Kids Continuous Spray, SPF 15 Lip Balm, spa/exercise towel. Includes: 4oz Core SPF 15, 4oz SPF Core 30, SPF 15 Lip Balm. Includes: 4oz SPF 30 +, 4oz Light Moisturizer, SPF 15 Lip Balm. Includes Pro Lip Balm, 4 oz SPF 30 Pro, 4 oz Water Sports Jelly SPF 30+, 4 oz Aloe Ice Jelly & 1 oz SPF 15 Pro all in a Large Mesh Bag. Size : 8 x 10.